Are you thinking or planning a short break to a sub-tropical region? Maybe you want your child/children or yourself to enjoy the adventure of exploring nature and learning about it. Well there is no need to go overseas to do it when you can do it here in the UK. 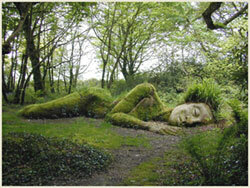 The Lost Garden of Heligan offers just that. With over 200 acres to explore, you or the young one can really lose yourself in this enchanting restoration Garden. Having lain forgotten for over 70 years, this stunning estate allows you to take an incredible journey back through time and experience living history in the horticultural playground of a bygone era, something the children will enjoy with this family friendly garden. The best part of the garden has to be the jungle. Exotic foliage provides home to colourful kingfishers, unsual insects and birds such as woodpeckers. A walk along the raised boardwalk takes you through this sub-tropical valley past swamps filled with Giant Rhubarb, thickets of towering bamboo and lush verdant banana plantations. The Lost Garden is host for a lot of fascinating vegetable and flower gardens amongst which are Peaches, Citrus, Pineapples and Melons.